Recorded at Dalston’s Vortex Jazz Club in December 2011, the night before the concert documented on Shores and Ditches, Overground to the Vortex (Not Two) documents Carrier and Lambert in a very different space, with very different guests. The Vortex occupies a small, oblong box of a room with a compact acoustic. Steve Beresford, who plays the house grand piano only on the second half of the set, is a seasoned improvisor, but also a wildcard performer with a mischievous sense of subversion. Double Bassist John Edwards can be gentle, but is renowned more for his stamina and resourcefulness in full-on power play: here he treads the middle line throughout all four tracks. On lead track “Mile End” (each title references a local place name), Carrier plays a succession of short phrases that needle bass and drums into wary negotiation and shifting alliances. It’s a discomfiting, circular exchange in which each player takes the others’ measure, setting up the more involving “Bow Road”. Here Carrier is initially more thoughtful, shaping a pliant melody to carry the flow of the improv. As the temperature rises he spits out short, increasingly variegated shards, igniting a brief, fiery bass/drums exchange, then becomes expansive again, lyrical even, as Edwards develops an abrasive arco response. Lambert propels the rhythm into a powerful collective surge, but when Edwards suddenly switches to rapid, muscular pizzicato, Lambert draws the heat from the performance by switching to a broader palette of percussive coloration. Though everything is fully improvised, “Bow Road” has the satisfying arc and dynamics of a through-composed piece. The final two improvs are markedly different. Steve Beresford joins in, taking the initiative on “Archway” with a puckishly Monk-like sally. Lambert responds robustly, and Carrier plays staccato lung-burst licks, and both respond powerfully to Beresford’s insistent questioning. As the piece develops, Carrier’s playing becomes more acerbic, and Beresford more tumultuous, albeit the latter reverts to jaunty postbop rills in fragmentary solos, and retreats to an almost ambient role when the temperature cools. The creative four-play becomes increasingly introspective as this 28-minute performance loses momentum; or perhaps attains an engaging equilibrium; my response to it varies according to my mood. On “Barking Side” the quartet resolve to toughen up responses, and focus on moment-to-momet sound-sourcing. There are occasional lacunae, with moments of stillness prompting fresh initiatives, and an ongoing dissipation of collective energy into wary exegesis. Carrier responds with coarsely plaintive licks shading into muscular lyricism, and passes the baton to his bandmates, prompting Edwards and Lambert to in-fill the loose weave of pianism and saxophonics with percussive aggregate. Overground to the Vortex documents an intriguingly protean session, inchoate despite the power and lucidity of the player’s individual contributions and their edgy interplay. There’s a substantial outtake from this session, a powerful 22:42 performance titled “Overground to the Vortex“, currently accessible on SoundCloud. The album would have benefited from its inclusion, whether as a double album or at the expense of the tracks featuring Beresford, though the latter option would be a shame, as it would be a more routine affair without them. François Carrier alto saxophone; John Edwards double bass; Michel Lambert drums; Steve Beresford piano. Neil Metcalfe, Guillaume Viltard, Daniel Thompson / François Carrier & Michel Lambert – Garden of Water & Light / Shores & Ditches. Roscoe Mitchell, Tony Marsh, John Edwards – Improvisations. John Edwards & Okkyung Lee / Pat Thomas – White Cable, Black Wires / Al-Khwarizmi Variations. 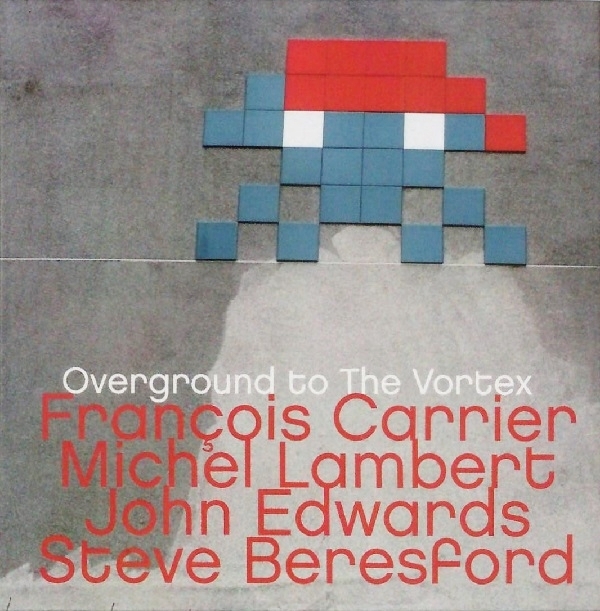 This entry was posted in Album and tagged François Carrier, John Edwards, Michel Lambert, Overground To The Vortex, Steve Beresford, The Vortex. Bookmark the permalink. Reblogged this on Musical Journey's Blog.